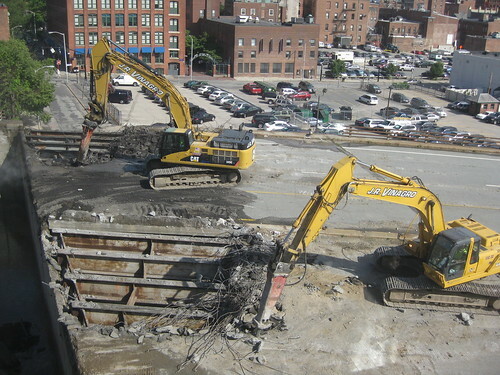 The final Route 195 overpass on the west side of the river started coming down today in earnest. 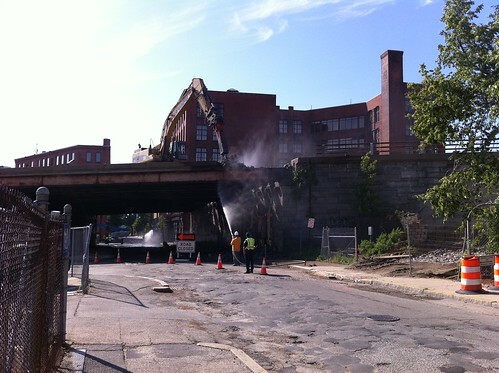 Chestnut Street is currently closed at the Old Route 195 and crews are furoiously working removing the bridge. The entire Jewelry District is shaking as they bang away at it. Under the bridge. Everyone got all weepy when the murals came down on Wickenden Street, no love for the mural on Chestnut? I totally spaced on the fact this was happening today and had planned on taking another route to work, so I wouldn’t have to take a grand tour of the Jewelry District on foot to reach my destination. You may have noticed, there are no sidewalks. There are cones to warn you of the lack of sidewalk. The Richmond Street overpass came down in March, it is not like there has been no time to install a proper sidewalk here. 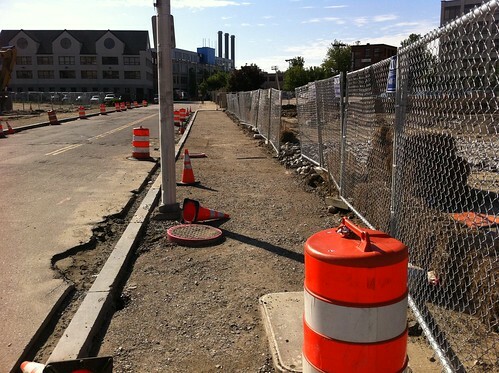 Even an improper temporary sidewalk would have been nice. 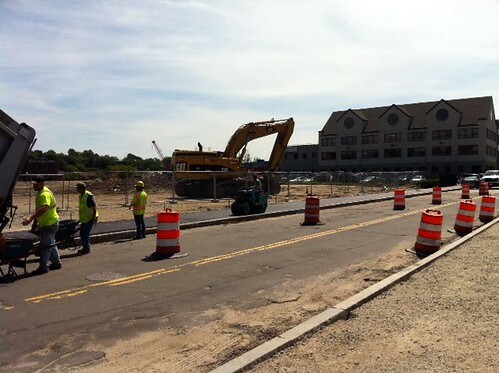 You’ll notice there is a road in place though, thanks RIDOT! 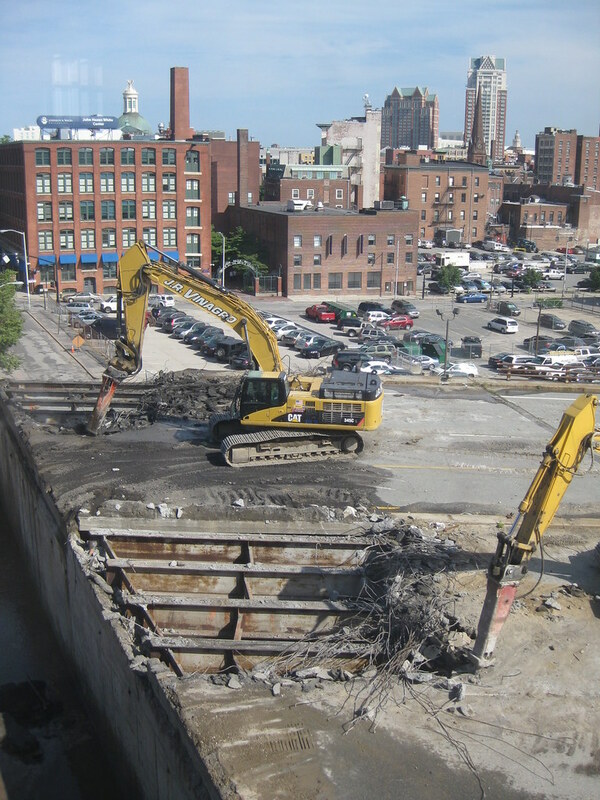 Share your photos of the Route 195 demolition with us on our Flickr Group or email them to contact@gcpvd.org. 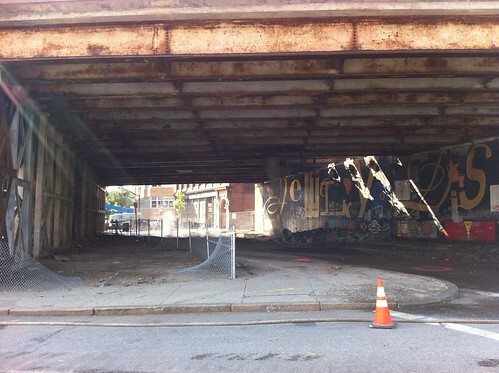 I will miss the Chestnut Street overpass mural. Is _anyone_ making plans to save even a portion of it? 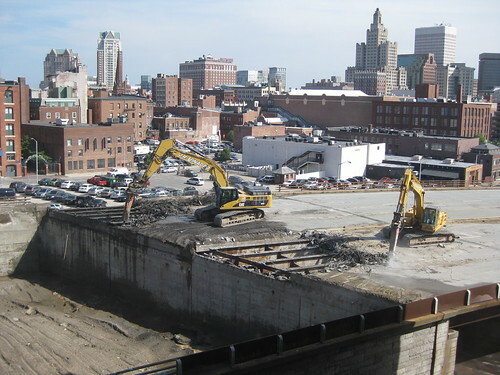 Having lived and worked and raised my children in the Jewelry District from the Spring of 1979 until I moved (also in the city) in the Winter of 1997, I always looked forward to the cooling respite of that overpass after doing “walking errands” in and around downtown Providence. It would be a shame to have that entire mural vanish, be demolished and become rubble and dust. Thanks for the images – and good memories.